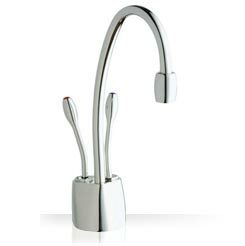 Offering both hot and cold filtered water from the same tap, the HC1100 can produce near-boiling water on tap, as well as safe, filtered cold drinking water on demand. Special scale reduction technology protects heating elements. F-701R will come standard with all 1100 series systems. It is a chlorine, taste and odour filter with additional lead protection and a scale reduction capability. It filters sediment at a 5 micron level. It is sold as replacement filters in a two pack carton.